China’s Singles’ Day and the United States’ Cyber Monday are the world’s most famous online sales events, with mobile becoming shoppers’ preferred platform on which to hunt for bargains during these extravaganzas. 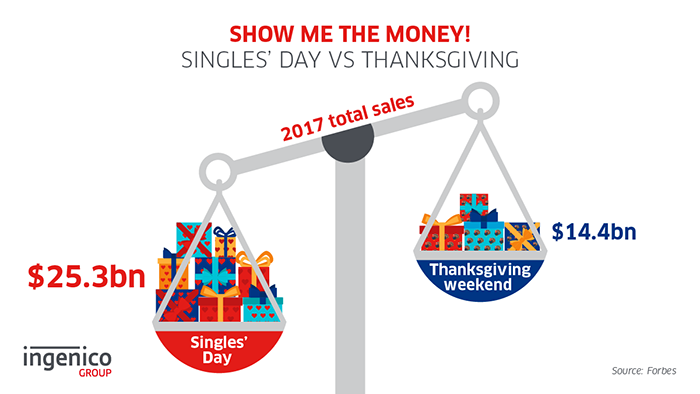 Despite the hype often seen surrounding Thanksgiving, Black Friday and Cyber Monday turbocharged shopping weekend, Singles’ Day eclipsed the competition, totalling $25.3 billion in Chinese sales versus the US’s $14.48 billion. Back in 2013, 21% of Singles’ Day sales came from mobile devices, which has since grown to 42% in 2014, 68% in 2015, 82% in 2016 and 90% in 2017, while sales revenue tripled over the same period. For November’s Cyber Monday, mobile shopping accounted for 43% orders, up by 10% from a year earlier. Three quarters of millennials said they are more likely to shop on smartphones than computers and will shop around for a better deal. China’s Alibaba, which generated 90% of its $25.3 billion in sales this year via mobile platforms, has invested $8 billion to create bricks-and-mortar retail stories and wants to create a “seamless blend of the online and offline”. Shoppers at the company’s supermarkets can use its app to scan barcodes to pay or to read production info, with bought groceries then delivered to their home.